A graphic image is usually easy to create or easy to obtain. Your sponsor or advertiser probably has a logo, or some other image they want you to use, just ask them! If they do not, we can create one for you for for a nominal fee. An audio expression is also easy to create or obtain. It's just some words (ad copy) with music in the background. If your sponsor or advertiser doesn't have one, make them one! Offer it out as a part of your 'package' deal! 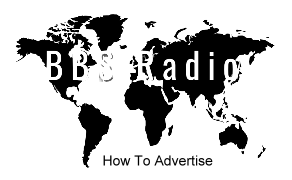 If you use BBS Radio's services, then we make it super simple! All we need is add copy (some words on a page, usually text you obtain from the sponsor or advertiser). With that in hand, we can easily do the rest! We will create your first one for free, but then we will charge you a small fee per audio expression! We also have 1,000 songs we have derivative rights to use, and you can select from them all, at any time (see background music)! You can also request that we tape your voice, use our voices, or tape someone you know, using a phone or Internet connection, in minutes! You will get final approval! Keep in mind, we are quite good at this! We've created thousands! Turn around time is usually less than 24 hours! Inexpensive creation of audio commercials, promos, bumpers and liners! and Inexpensive editing of podcasts and other audio tracks! and Free creation of intros, outros and a commercial for your program! and Free creation of program banner! and Free creation of syndication banner! and Free background music for audio developments! and Add graphic banner ads with hyperlinks! and Add audio tracks, commercials and promos! and Free advertisement placement on all live station streams!